"It was my dream to live on the beach in beautiful Florida," said Yelena Kazakova, who owns a unit in the Aquarius condo there. "The sun, the ocean, just every day you wake up and you see this beauty and it lifts up your spirit." But Kazakova, a physician’s assistant, reality crashed in, quite literally. Last summer, for instance, the ceiling over the once pristine lobby caved in during a flood and it remains a mess. The gym has suffered a similar fate, with gutted ceilings and walls. 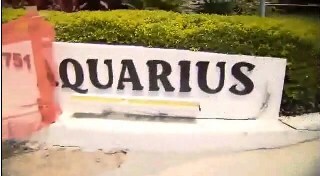 The Aquarius board of directors – which has been a veritable game of musical chairs during recent years -- says the entire foundation of the building is crumbling. "There has been nothing but chaos," said Kazakova’s neighbor, Paul Mangiamele, a part-time resident who happens to own the Bennigan’s restaurant chain. "Chaos in the sense of construction projects that never seem to finish. We can’t use the pool. We can’t use the lobby. We can’t use the west pool. We can’t use the fitness center." "We were assured because of the Trump property next to us and the amount of money paid to the Aquarius units that assessments would never occur for the lifetime of our stay here," said Mangiamele. "It gets to be suspicious when it’s now assessment after assessment." He is talking about a recent $1.7 million assessment that has apparently been spent and a recently passed new assessment of $4 million, or about $15,000 average per unit, bringing the grand total including the Trump money to about $10 million. Further irking unit owners, the $4 million hasn’t been contracted yet, making some unit owners to feel as if it’s just another blank check for a board that has wildly mismanaged the two Aquarius buildings for years. "Where’s the detail? When are the projects going to be completed?" asked Mangiamele. "Just common sense questions. Just show us where the money is going. We have no problem helping to make this the jewel that it should be but just give us answers." 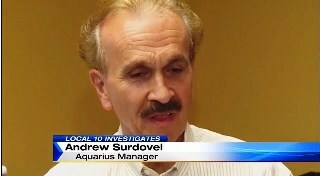 When asked about the residents’ concerns and all that money spent, Aquarius property manager Andrew Surdovel quickly pinpointed what he said was the real problem. "Mismanagement of money, that’s all I can say," said Surdovel. He can say that since he only took over the management of the condo in November. He said a recent audit uncovered bookkeeping problems that are now under further investigation. "There has been some irregularities and they are looking at it right now," he said. Examples of the mismanagement aren’t hard to find. A renovation of one of the condo’s pool deck’s was supposed to cost $1.5 million, but the actual cost has already ballooned to to $2.1 million, eating up the previous assessment and with no end in sight of the rising costs. "They really didn’t do their estimates correctly, they just shot from the hip," says Surdovel. And the lobby? It flooded after the board failed to waterproof the construction job above it, says current Board Vice President Joel Cohen. Then there’s a project that began when the board decided to move a small bathroom on the pool deck. The cost has gone out of control. "It’s a $125,000 toilet," said Cohen. Yet Cohen and the board are forging ahead with more construction, with the board voting to hit the 269 unit owners there with the new $4 million assessment. Part of that job is concrete restoration which requires that that pavers at the building’s entrance be destroyed. Residents are upset this too is setting up to be a disaster as the board has no contracts in place for the $4 million, only a $2 million "change order" from the construction company that is working on the west deck. A group of residents formed a human chain in April to try to stop that work and were successful when it was learned there was no current permit to do the work. But the respite was short-lived and the destruction in May, leaving residents to hope it’s not another costly debacle that will end with more demands on their own checkbooks. "My dream of living on the ocean," said Kazakova, "is getting destroyed."